1. I am finally using my Lock Laces and let me tell you that I LOVE them! Never again do I have to tie my laces again. I remember I had a pair of Yankz but for some reason I did not like them so I either threw them away or gave them to a friend. I hope it was the latter. And because of the Yankz experience I hesitated to try the Lock Laces but am so glad I did. They come in different colors so you can match them according to your shoes color. Mine don’t really match because those came in my June StrideBox but I still like them. 2. Yes I am Disney crazy so I signed up for the TinkerBell Half Marathon in January. 3. Lately I’ve been hearing so much about Aquaphor as an anti-chafing cream. I chafe… A LOT. I’ve been using BodyGlide for as long as I can remember but I still chafe. There is nothing worse than taking a shower and screaming in pain as the water hits that raw area. I found a small Aquaphor tube in my dresser and will try it out and see if it is as good as people are saying. Tinker Bell- COOL! I'm also thinking about getting laces of those types. I have a pair of racers that sometimes come untied. I'm going to buy a pair of lock laces with my next amazon order!Funny story, i forgot the name of Bodyglide, and just remembered glide. So when I was talking to someone and was trying to suggest the product, i was like, yea, just use some astro glide, supposed to work great! It took me a minute to realize what I said…With that, I actually just use vasoline for areas that become problems. Oh my gosh – I LOVE those pink and black shoes. Are those Brooks? Glad to hear that the lock laces work so well, too!Yay for Tinkerbell! Are you going for the Coast to Coast challenge next year? I heard that they've got a special-edition medal so that would be a great addition to your medal collection!I've never heard of Aquaphor so I am excited to see what you think of it. Bodyglide works well for me but I'm not thrilled with the way it smells (maybe I need to try to "female" version of it, LOL. Go to the Lock Laces website instead and use code TLT4C for free shipping, Plus, 20% of the profits go to a charity.And that is funny about the glide/body glide/astro glide. Go to the Lock Laces website and use code TLT4C for free shipping, Plus, 20% of the profits go to a charity. No, the shoes are Mizuno Elixir. I love the color but don't think they provide enough support. I bought a pair of Brooks PureFlow in purple and am supposed to get them tomorrow. 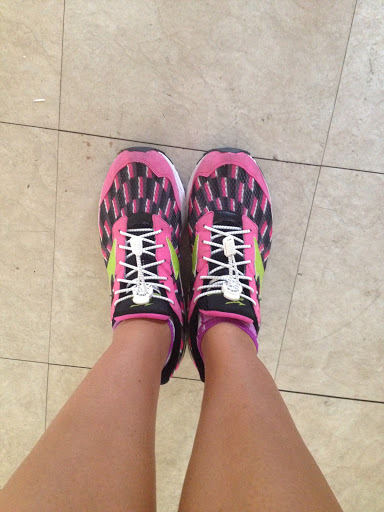 Cannot wait to run in them.Yes, Coast to Coast Challenge next year!.I like Aquaphor. It does the job. Plus, I think it is easier to apply than Bodyglide. I've converted. I have two small samples that fit nicely in my shorts to take with me during my runs. They came in handy on Saturday when I was chafing in other areas.